My '53 is the mostly red car in the far lane. My partner is probably at the wheel, since it was my camera that took this photo. That hood scoop is made from a slightly flattened half of a spun aluminum "nose cone" collected from a surplus store. 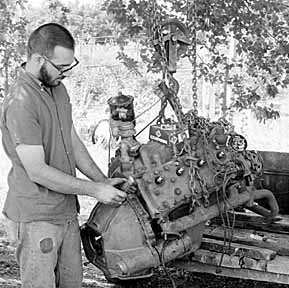 It connected to the carburetor by a #10 can which had a carburetor-sized hole cut in the bottom and a foam collar around the top to seal it against the hood. You can see one pipe of our home made equal length headers snaking under the bottom of the car. 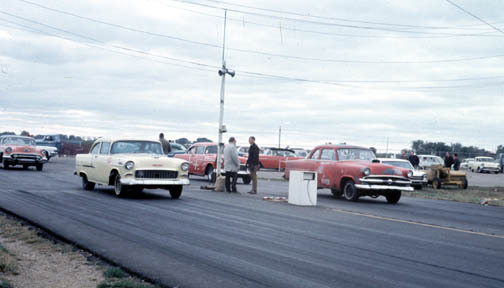 The photo was taken at Wichita International Raceway Park as it was known in those days in about 1967 or 1968. Me in my younger days - about 1966 I would guess.